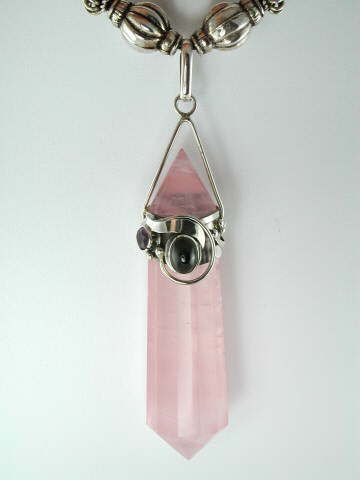 These hand-crafted Ray of Light Wand Pendants are quite exceptional. Designed in the style of the famous Vogel Healing Wands, created by Dr Marcel Vogel, these stunningly beautiful, faceted wand pendants are handcrafted in quartz - Clear, Rose or Amethyst - and adorned in sterling silver set with semi-precious gemstones. This one features a large, oval, Green Tourmaline cabochon with a small, round, faceted Amethyst. It comes on a waxed cotton necklace threaded with four silver beads which measures approximately 24cm from top to bottom.